It is 1793. I am Louis de Richet: a Frenchman who inexplicably talks with an American accent. I am trying to convince an Italian cardinal (who does speak with an appropriate accent) to hand over an important letter, although it is not going well – he is concerned that I am not trustworthy. To reassure him, I choose a response from the dialogue tree that explains he can be sure of my vigilant discretion because I am a member of a top secret organisation of influential movers and shakers. Combat was also traded for dialogue in Subsurface Circular. The cardinal raises his eyebrow at me. Yes, perhaps openly revealing to a stranger that I am part of a clandestine society does not do my argument any favours. And so it is time to crack open The Council’s flagship feature: skills. My version of Louis is learned in the ways of manipulation, and so I pretend that I am not really interested in the cardinal’s special letter, and reassure him it will find its way to its destination – my mother – without my help. Suddenly worried that I may be the only person capable of delivering his information, the cardinal hands over the document. Success. 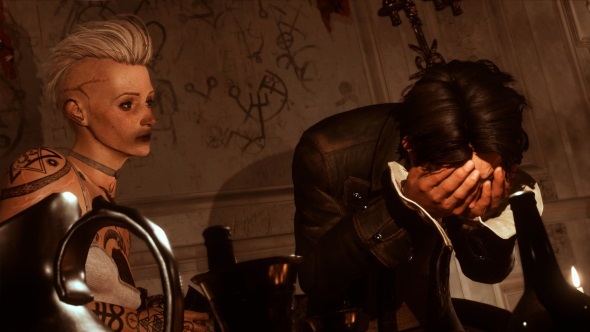 The Council is a Telltale-style adventure game that tells the story of Louis de Richet’s search for his missing mother, the leader of the shadowy Golden Order. Louis’s search brings him to the private island of Lord Mortimer, where he hopes a party attended by the likes of Napoleon Bonaparte and George Washington will help reveal his mother’s whereabouts. In many ways, the game feels like a modern Broken Sword, filled with shadowy clues and a narrative that delights in dissolving the barrier between historical fact and fiction. But The Council’s stand-out feature is its detailed RPG system. Multiple, layered skill trees unlock abilities that allow Louis to discuss whole new topics of conversation, more closely observe the environment, and analyse characters to exploit their weaknesses – and that’s just the start. During The Council’s opening you select one of three classes: politician, occultist, or detective. Politicians talk with confidence about the ways of the world and are able to adopt the correct etiquette for the company they keep. Occultists are educated in the ways of the weird, and are skilled at identifying artifacts, performing scientific studies, and reading lost languages. Detectives are skilled in observation, psychology, and are able to pursue intense lines of questioning. 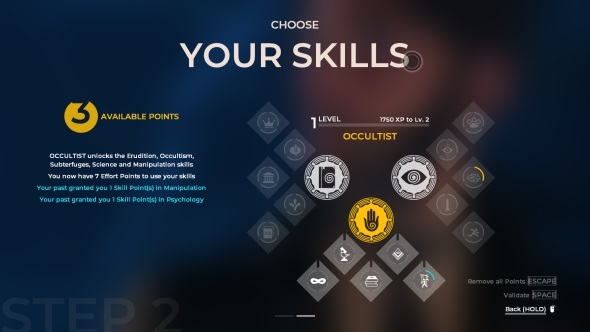 Each class has five skills associated with it, although freeform progression allows you to invest in any of the 15, so you could happily be an occultist with a passing interest in politics, or someone with a rough understanding of everything. Skills are unlocked by spending points that you earn through successful conversations. Investing points across every skill pool will provide you with the tools to react to pretty much every opportunity the game has to offer, of which there are a substantial amount. Every conversation has several dialogue options available only to those who have invested in a specific skill, and the more subjects you push points into, the more options you have during your investigation. The problem with spreading yourself across all three skill trees, however, is the effort required to perform skill-based actions. You have a pool of seven effort points, which is not a lot when you consider that each skilled action requires a few points to enact. The higher your level in a specific skill, the less effort required to perform it, to the point of the skill being free at higher levels. So while a multi-talented Louis may theoretically be able to take advantage of every opportunity provided, every action will take effort, draining that pool of points rapidly. A Louis focused on a small number of skills may miss out on chances to learn new information but will effortlessly manipulate a character into revealing their secrets. I focused my Louis on occultism for my initial playthrough of The Council’s first of five episodes. A puzzle mid-way through the story required me to read text written in invisible ink, which proved easy, thanks to my high science skill. A dedicated detective would have struggled, but would have taken advantage of the many conversation paths I failed to notice due to my lack of questioning skills. The game frequently points out instances where you could have made conclusions or interrupted the conversation were your skill set different, encouraging replays with different builds. We are used to skill points in RPGs being applied generously to combat abilities while few unlock extra dialogue options – usually through persuasion or intimidation. The Council repurposes skills to focus on knowledge and social capability: Can you perform a Sherlock-Holmes-like deduction by spotting how a person composes themselves? Are you able to impress and influence a character through your knowledge of their culture? Rather than equipping weapons, the vulnerabilities and immunities of Lord Mortimer’s guests are revealed through conversation, which allows you to strike with the right words when necessary. It is an incredibly clever system that makes social interaction feel as tactical as a turn-based battle. The multitude of skills and how they unlock the story’s secrets provides a series of small pass-or-fail moments, while the plot has a number of more obvious forks in the road. The result is a narrative that feels like it has far more reactivity to your actions than Telltale’s approach. Even if two people took the same route, the minute aspects of their experiences would be different depending on what their skills revealed to them. One can only expect that the narrative planning board at the offices of developers Big Bad Wolf fills up six rooms and uses 17 balls of wool to connect all the dots. The Council is a special game. Tight integration of its RPG ideas into the narrative adventure formula creates something that feels fresh, experimental, and – above all – like a game. Telltale’s interactive television format has been a success but offers little to think about aside from the flow of the character’s lives. By weaving skills into the experience, Big Bad Wolf have produced a similar experience with far more agency for the player. We have seen some adventure games, such as Sherlock Holmes: The Devil’s Daughter, that made themselves more game-like by adding ill-fitting action components. The Council rejects that idea, instead adding game logic to the concepts that the genre already possesses. 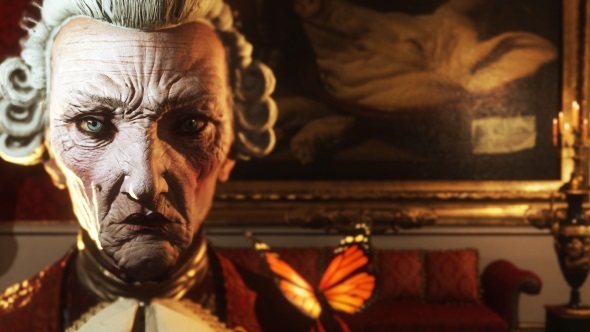 The result is excellent and, combined with the deft mystery of the story – not unlike one of Agatha Christie’s -, The Council feels like a real step forward for adventure gaming.